Patty sent me this picture of my first-ever trail ride on my very own horse. It's from just two years ago, the first spring I had Merlin to myself. He was being boarded at Riding Right Farm in Cambridge because I signed the contract to buy him before I had a barn, paddock, or plan. I went with my gut, because I believe in love at first sight and Fool's Rush In. But no one told me how scary it would be learning to ride a horse outside the safety of lessons, arenas, and guided trail rides. At this point I still had health insurance, at least! In that picture I am terrified. I really am. I am certain Merlin knew it. Patty had trailered Merlin from the stables and brought him to her farm. 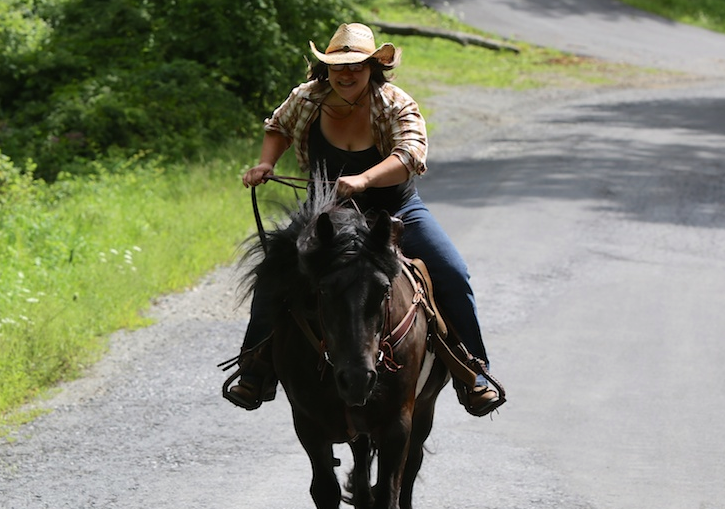 We rode from her property over to the large estate across the road, hundreds of acres and tractor roads in a beautiful place with views that wash all across the surrounding farmland and faraway Green Mountains in Vermont. It was a big step for me, that first ride. It probably took another two hundred miles in the saddle to be at ease and feel mildly competent in our relationship, temperments, and control. Jenna, I love these two pictures. They would be a wonderful set to have hanging on the wall - the very best kind of before and after, documenting a brave and successful journey. Fabulous! Thanks for sharing. I love the photo bookends. They tell such a story. Love, love, love it... My love of horses is never-ending, but I've never been a very confident rider, and having owned or ridden every type of horse there is (from the green-broke Thoroughbred cross to the spacey Arab/mustang to my lovable dead-broke old Quarter horse gelding) I've managed to live through every experience. The second photo says it all. The joy and confidence in your face speaks volumes! And good for you for your willingness to ride both English and Western. Each discipline teaches the rider something new and useful. Jenna, thanks for sharing these photos and the story behind them. Your sharing of your journey on this farm and with these creatures is inspiring. I have wanted to learn to ride since I was small, but my parents couldn't afford lessons. Now I'm in my 40's, and my sister and I started lessons a couple of years ago. It's a slow process -- family commitments and health issues have interfered with steady progress -- but we are both making progress and we love it. I hope someday I might be able to get to where you are now with Merlin. The joy in your face in that last photo is wonderful! Love seeing your triumphant photo at the end! I've been down the same road with my big guy as well. There is just something about these creatures that once we get to know and understand, frees something from within us. Wonderful end shot! You totally did it, and I admire your courage. I tried to get back into horses last year (after being a fearless young rider for many years) but it ended in disaster (long story, lol). What a difference in the two pictures. You did it indeed! I'm enjoying the blog! It seems a lot more positive and encouraging lately ~ kudos! Love this post. I mean LOVE.